We started making these back in the spring and they are so good that it’s turned in to our go-to dinner when we don’t feel like coming up with something new. There’s so many things to love about this recipe (aside from the fact that it’s delicious! ), starting with the fact that you can use any part of the chicken. If we don’t have one that we’ve cut up ourselves, we get whatever is on sale at the grocery (this time it was 5 huge drumsticks). The chicken gets tossed in a brown sugar rub that, when baked, caramelizes into a sweet flavor that goes awesome with some other savory ingredients. 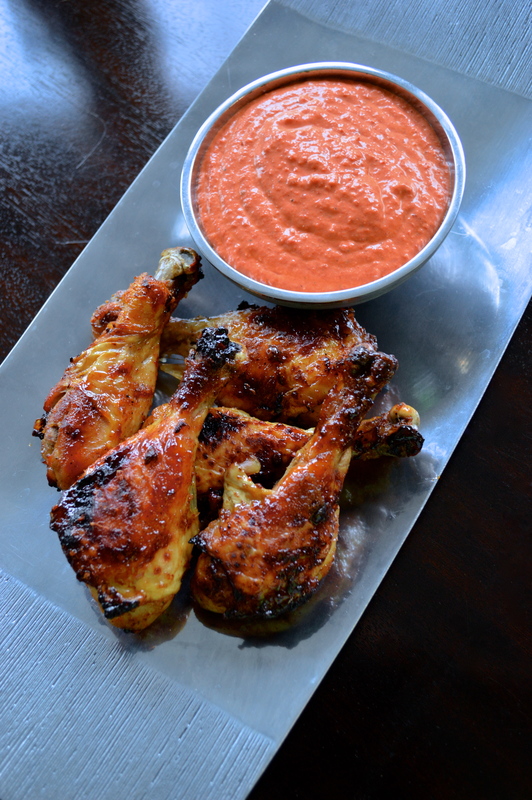 The roasted red pepper dipping sauce is super easy to make (and can be made ahead of time) and has my favorite, goat cheese! The tang from the goat cheese pairs perfectly with the sweet peppers and the sauce is seriously good on anything. Earlier this week we had it tossed with pasta and I use it often as a salad dressing! Recipe adapted from Domestic Fits (found HERE). To make the roasted red pepper dipping sauce you can roast your own peppers (in the oven at a high temp until blistered, then put into a plastic bag for a few minutes to steam the skin loose making it easy to peel), use frozen ones (thawed and drained) or use a jar that’s packed with oil (this is what we do). In a blender combine 1 cup roasted red peppers, 4 oz goat cheese, 1/4 cup fat free sour cream, 2 cloves of garlic, 1/2 tsp freshly ground black pepper and 1 tsp salt (1). Blend until smooth, adjust seasoning if necessary then store in an airtight container in the fridge until ready to serve! I like to make the wet rub for the chicken, toss it in it and then let it sit for an hour or so before baking but if you don’t have the time preheat your oven to 425 now. Make the rub by combining 2 tbsp olive oil, 2 tbsp brown sugar, 2 minced garlic cloves, 1 tsp chili powder, 1 tsp cayenne, 1/4 tsp black pepper and 1/2 tsp salt in a bowl (3). Whisk to combine, then add to a container with 1.5 – 2 lbs chicken drumsticks (or whatever part you like) that have been patted dry with a paper towel (4). Put the lid on the container and shake to coat (5). As I mentioned, I like to let that sit in the fridge for an hour or so but you can bake it right away if you like! Line a baking sheet with foil and arrange the chicken on it, pouring any excess rub over the pieces (6). Bake for 25-30 minutes (depending on the thickness of your chicken), turning over halfway through cooking time. Serve with the dipping sauce! 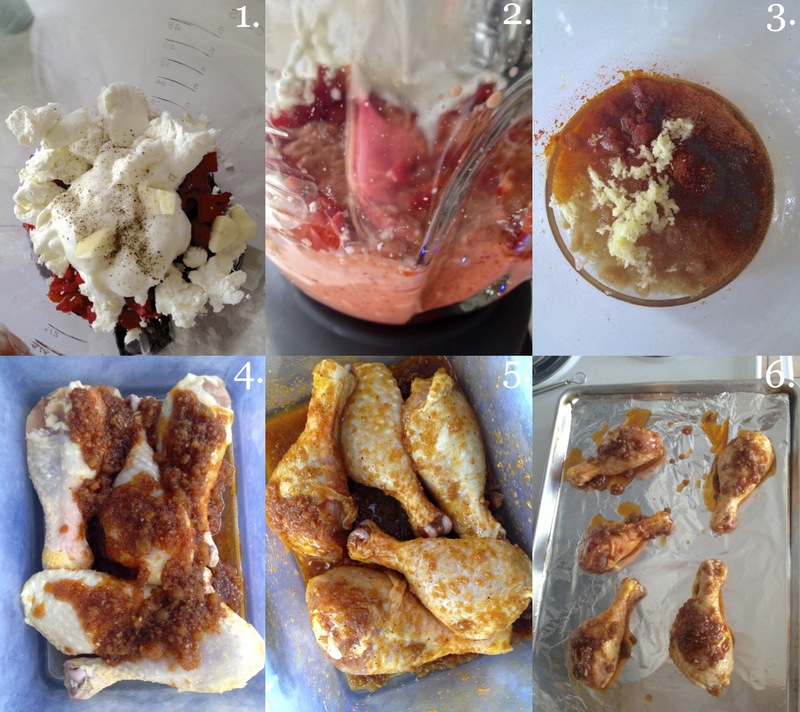 Make the sauce: In a blender combine the roasted red peppers, goat cheese, sour cream, garlic, salt & pepper. Blend until smooth, adjust seasoning if necessary then store in an airtight container in the fridge until ready to serve. Preheat oven to 425 now and line a baking sheet with foil. Make the rub by combining olive oil, brown sugar, garlic, chili powder, cayenne pepper, black pepper and salt.. Whisk to combine, then add to a container with the chicken, put the lid on the container and shake to coat. Arrange the chicken on the baking sheet, pouring any excess rub over the pieces. Bake for 25-minutes (depending on the thickness of your chicken), turning over halfway through cooking time. Serve with the dipping sauce! This sounds delicious! I will definitely try this recipe – thanks! Thank you! Once you have all the ingredients and can make it you’ll love it! looks delicious! i definitely will be adding this to my weekly dinner recipes! Thank you… you’ll love them! will try this next time i bring chiken. mouthwatering clicks !! looks delicious! I will need to try this! I love chicken! They are so good, you’ll love them!